A team of doctors from the Fetal Care Center at Medical City Children's Hospital were able to perform "open fetal surgery," the first procedure of it's kind in North Texas. DALLAS -- The fact that baby Uriah is squirming between naps is proof that his procedure worked. "It's amazing it's a great feeling," said Sarah Prowell of Terrill, Uriah's mother. At 18 weeks pregnant, Prowell and her boyfriend, Sean Kirby, learned that their son had spina bifida, a birth defect that prevents the spinal cord from properly forming and can lead to paralysis. "We were both pretty distraught at first because I was just worried about his life -- the road ahead of him," Kirby said. What they didn't realize is that their son was the perfect candidate for the first of it's kind procedure in Dallas. "Back when I was in medical schools none of this was being done," said Dr. Kevin Magee, a specialist in Maternal Fetal Medicine. A team of doctors from the Fetal Care Center at Medical City Children’s Hospital were able to perform "open fetal surgery," the first procedure of it's kind in North Texas. 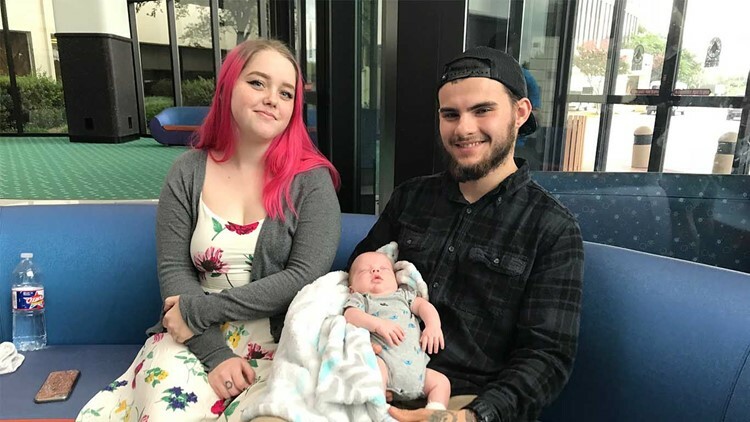 At 18 weeks pregnant, Sarah Prowell and her boyfriend, Sean Kirby, learned that their son had spina bifida, a birth defect that prevents the spinal cord from properly forming and can lead to paralysis. "We can intervene and save the babies live or prevent ongoing injury to the babies organs that's going severely compromise them for the rest of their lives," said Dr. Timothy Crombleholme of the Fetal Care Center. In June of this year, doctors were able to operate on Uriah while he was still in his mother's womb. "To think that this could be done today and to be done with this quality of outcomes is really exciting -- exciting not for the physicians but exciting for the families and for that little child," Magee said. But before starting, they needed mom's blessing. Knowing she would put her self to hopefully improve the life of her unborn child. "I think that just comes naturally being parent and wanting the best for your child," Prowell said. The surgery was successful, but Uriah was born pre mature. He would stay in the hospital for a month. He's only been home for two weeks. "I think the most emotional part of this whole process was sitting in the hospital waiting for him to come home that was really hard on me. Now, I'm just happy that he is here," Prowell said. His procedure didn't eliminate his disease but did repair damage before it would have become irreparable. "It's a step in the evolution of this entire field," Crombleholme said.